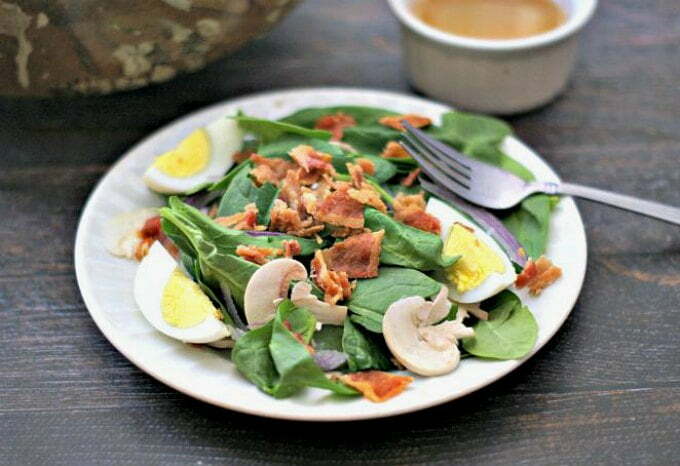 This is a classic spinach salad with hot maple bacon dressing. 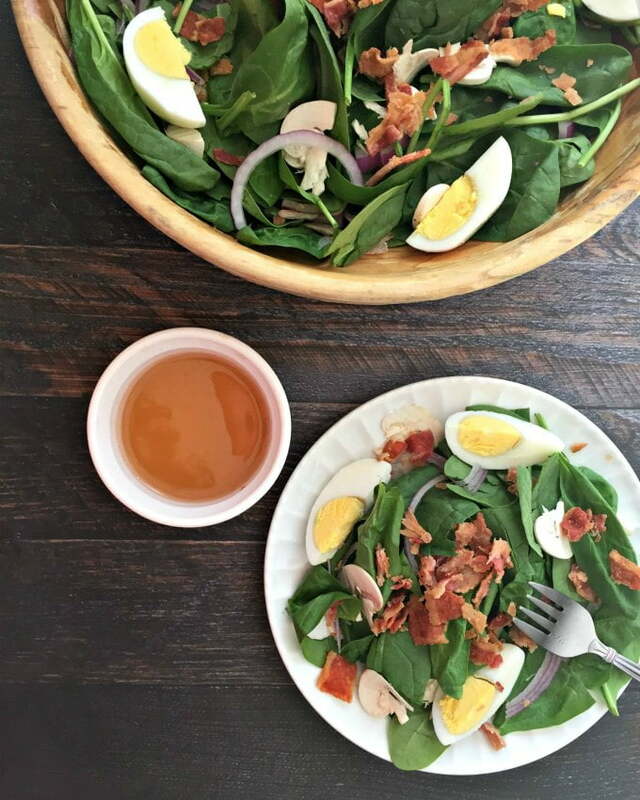 Bacon, eggs and veggies topped with the warm, salty and sweet dressing to make the perfect fall salad that is low carb and Paleo too! I love spinach salads. Do you? I regularly buy already washed baby spinach from Aldi so I can have a spinach salad at a moments notice. 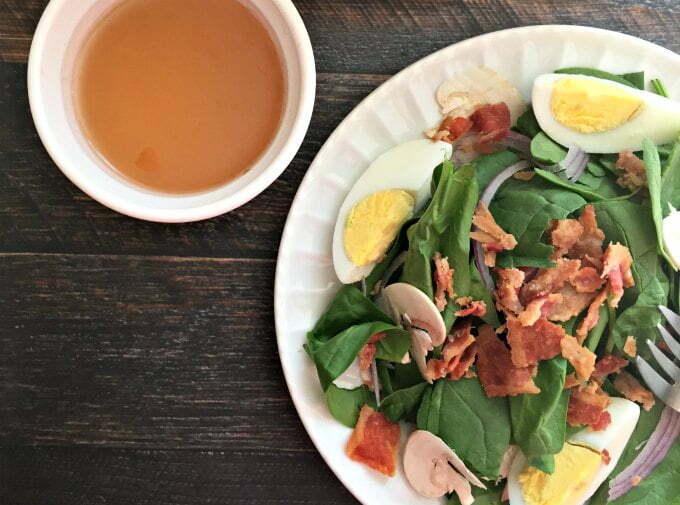 But to have a classic spinach salad (IMO) you have to have all the components: spinach, red onions, fresh mushrooms, hard boiled eggs and of course crunchy bacon. What a great combination. You also need a good hot bacon salad dressing and since I’m on a maple syrup kick, I thought that might be a good addition. This hot maple bacon dressing is now my quick and easy go to spinach salad dressing because it only takes a few minutes and tastes so good. So the first thing you want to do is make the bacon and save the bacon grease for the dressing. 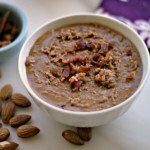 This recipe calls for 3 Tablespoons so make sure you make enough bacon to get 3 Tablespoons of bacon grease. Then add some maple syrup and white balsamic vinegar like this. I bought my white balsamic vinegar from Trader Joes. I hope they still have it when I go back because I’ve been using it quite a lot. It’s not as strong as the darker balsamic vinegar and is perfect for salad dressings. That’s all there is to this dressing. 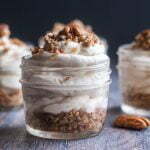 Whisk it up in a bowl, heat in the microwave until bubbly and then whisk it one more time before tossing the salad with it. 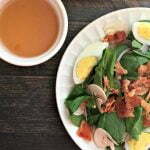 Garnish the salad with bacon and eggs and you have a delicious salad for lunch or dinner. 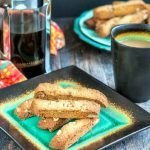 I hope you like this simple recipe. It’s a nice hearty salad to eat on it’s own but can be a lovely side salad to serve with a simpler dinner too. 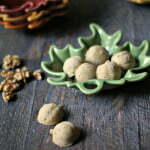 This recipes makes about 6 servings. Toss your spinach with the mushrooms and onions. Save the bacon and eggs for garnish. To make the dressing, add the bacon fat, vinegar and maple syrup to a microwaveable dish. Heat on high for 1-2 minutes until boiling. Let cool a minute and then toss the salad with hot dressing. Top with eggs and bacon.